But how do you develop these skills, especially when working with a volunteer choir? 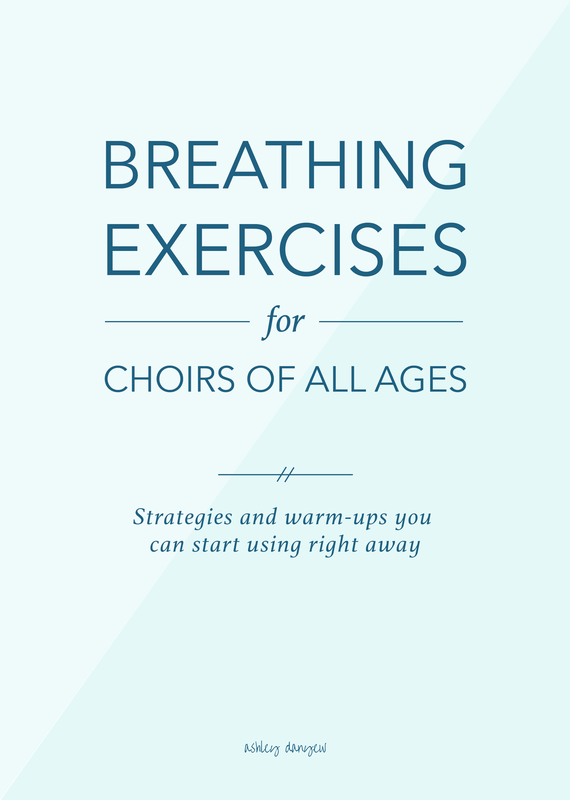 Today, I'm sharing a few warm-up exercises and helpful teaching strategies for talking about breath and helping your choir members (of all ages!) develop breath control and good breath support. When we breathe in, the diaphragm flattens out, pressing the stomach and intestines down and pushing the rib cage out to create space for more air. Exhale first to get a fresh, full breath. Breathe in using the diaphragm, not your lungs. Be careful about your shoulders going up when you inhale. Try putting one hand on your shoulder and one hand on your abdomen. A quick word of advice - don’t spend too long doing breath exercises, as it may cause lightheadedness. Choose a few of these per week (rather than trying to do them all in succession in one rehearsal). Some directors recommend breathing in, holding for a few beats, then releasing on a hiss. Conduct this exercise and count out loud for the choir. You might also consider finding a piece of recorded music to accompany this exercise - something in 4/4 time that maintains a steady beat. If working with children, use your imagination to make this exercise a little more fun. I've seen directors describe this as taking a big sip of a milkshake (sucking in through a straw), holding, then spitting it out! This vocal warm-up is a great way to connect breath to tone and vocal production. Using numbers, sing a 5-note scale up and back (e.g. 1-2-3-4-5-4-3-2-1). This is a relatively short phrase (depending on your tempo, I suppose), so this should not be too challenging for your choir. Next, try singing the same scale twice in one breath, same volume and tempo as before (e.g. 1-2-3-4-5-4-3-2-1-2-3-4-5-4-3-2-1). If your choir is up for the challenge, try singing the scale three times in one breath, same volume and tempo. 1234 54321 Sing this exercise on a lip trill (humming + buzzing lips). These exercises are great to do at the end of your warm-ups, before moving on to anthems. 1111 2 3333 4 5-8-5-3-1 (“zing-a-zing-a-zah, zing-a-zing-a-zah, zee-oh-zee-o-zee”) This exercise helps develop stamina for singing through longer phrases. 1-3-5-3-1 or 5-3-5-3-1 (“ha” or "va") Bounce lightly on each note; feel breath engage. *Note: This could also be a fun change-of-piece in the middle of your children's choir rehearsal. Ask for a few volunteers to share a joke with the choir, then sing this exercise as a response (musical laughter). Lip Trills. Engage the breath when singing by singing once on a lip trill (humming and buzzing lips). It takes a certain amount of breath to sustain a lip trill, requiring renewed breath support and a steady stream of air throughout the phrase. Once you've done this, sing the phrase with text, but keep the same amount of energy and support. (source) Children love singing on lip trills! Chant rhythm. Use a consonant sound such as "sh" or "ch" to chant the rhythm of a phrase. Have choir members place one hand on their abdomen to feel the diaphragm engage. Next, sing the phrase with that same engagement. (source) For children's choir, try chanting the rhythm of a familiar song (like "Row, Row, Row Your Boat") using only consonant sounds. Change consonant sounds for each phrase. Preparing to sing. Practice inhaling silently (no gasping) in 1, 2, 3, and 4 beats. Remind singers not to wait to breathe until the last half of a beat before their entrance! Practice leading into their entrance and having them breathe in steadily over the course of several beats. Do you do breathing exercises with your choir? What are your favorite breath warm-ups?